Travel with Kevin and Ruth! : Heading North! We're heading north this morning! Click "View Larger Map" if you want to see the route in more detail. Is that pretty much straight north or what??!! Our major stops will be Albuquerque, Denver, and Saskatoon. If anybody lives anywhere along our route and wants to offer us a place to stay for the night, we would gladly take you up on it provided it's not too far off the route. 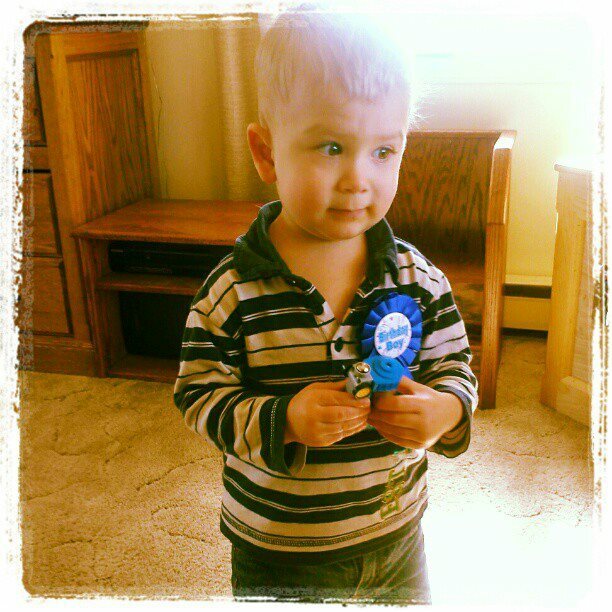 Happy Birthday to our grandson Cameron...2 years old today!!! Well i see you wont be anywhere near St Louis...darn..well Sam and Cmeron share the same birthday. Hope he doesnt hate April Fools jokes as much as Sam when he gets older. Nope, sorry Donna but we won't be going in your direction on this trip. I remembered that both Sam and Cameron had the same birthday, hope Sam had a good one! Cameron is really growing. Happy birthday to him! Sorry, we are over in Augusta, GA. A bit out of the way. What happened to the great maps that set your blog above all others? This map was to large a distance to cover properly in a regular map style that's why Kevin provided the link. Love your blog and taking the time to let us enjoy your travels too! Have a safe trip and hope some readers along the way get to meet you. If not next year maybe the year after that! That definitely is a straight shot north to your summer location. Hope you get lots of invites along the way. You two are great ambassadors of goodwill, fun, and friendship. We are so glad you stopped in with us on your way south in the fall. Happy second birthday, Cameron! Love the pose - looks a little like Grandpa Kevin in the pic (I think)! Thank you Connie and Barry! We had a great time visiting with you last fall as well. A straight run north should keep the gas prices within budget. I agree with Connie, Cameron is looking more and more like Kevin. Sturgeon Lake Regional Park near Shellbrook, Sask. Hope to see you there!